Not only is the Guitar Barre well suited for anyone wanting to easily get started playing the Guitar, Banjo, Ukulele, Mandolin and other fretted instruments, it is the perfect tool for those with a disability that might otherwise preclude them from playing at all. We have many satisfied customers with hand injuries, missing fingers and arthritic conditions which would limit their playing ability. For most of us, there just isn’t enough strength in one finger to push all the strings down at a fret to produce barre chords (as is the case with traditional barre chording or with a 'slide'). One of the beauties of the Guitar Barre is its wide finger rest, enabling one to push down with the entire hand, not with just one finger. Another versatile feature of the Guitar Barre is its two interchangeable 'bars', one soft for regular play, and one hard for 'slide' style play. For those having difficulty pushing all the strings down at a fret, even with the Guitar Barre (e.g., young children), the 'hard bar', which acts as a moveable fret and does not require that the strings be depressed all the way down, facilitates beginning success. And finally, for those who find holding a guitar and interacting with their chording hand in a traditional fashion difficult, our "CHILD'S BARRE" is the perfect solution. In this approach, the guitar is laid flat, labels are placed on the face of the fretboard, and one just pushes the "CHILD'S BARRE" down at the appropriate fretboard label to produce the desired chord (similar to the way a dobro guitar is played). For more on this technique, please see our For Young Children page. 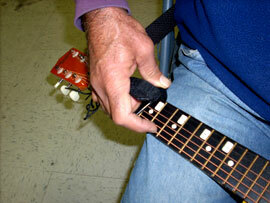 The GUITAR BARRE® METHOD is successfully being used to play the guitar by those with only one hand. With the instrument on the players lap (labels on the face of the fretboard), the GUITAR BARRE is held in either of two ways (pictured to the right), and is pushed down to barre the desired chord, while the index finger is used to strum the strings. 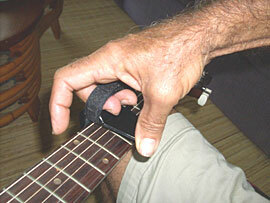 With a little practice, this is a very easy and powerful method, for those with this kind of handicap, to be able to chord any guitar, banjo or ukulele. For more information on how this is being done, please email or call us. To facilitate barre chording for blind players, stick a little piece of adhesive backed velcro at 2 to 4 of the most commonly used frets for barreing, in the same location as where the labels would be. Then the player can feel their way, with their thumb grasping around the neck, for the correct barreing positions for these 2 to 4 most commonly played chords, and align the bar accordingly. Oftentimes, playing with one's eyes closed add's a new dimension and special ‘feeling’ to guitar playing. With the velcro tabs described above, one can intentionally close one's eyes and play successfully. This also is helpful when playing at night when there is inadequate light to see the chord labels (use beige velcro). Optionally, one can apply some sort of white stickers, easy to see in the dark, over the labels instead.